Spray deodorant for rooms and fabrics with a White Tea perfume, for a discreet and delicate atmosphere. This product is also available in "sandal and teak", "mint and verbena", "bouquet of rose and jasmine", "vanilla and citrus", "ebony wood", "lemon and ginger" and "100% lavander". After shaking the can thoroughly, press the distributor nozzle for a few seconds, upwards, towards the unpleasant odour or on the fabric to perfume. Spray the product for no more that 4-6 seconds in normal environments. DO NOT exceed the indicated quantities in order to prevent accumulations of flammable gas. Rooms, fabrics, curtains, couches, clothes, rugs. 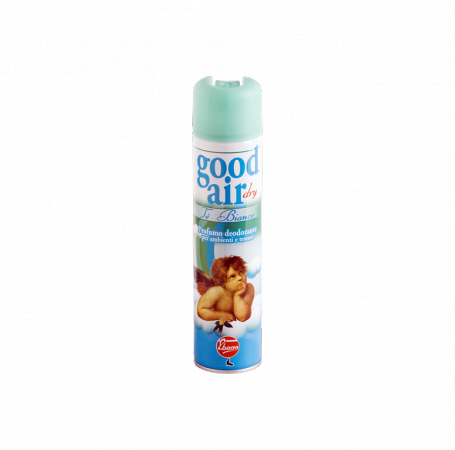 Good Air Dry is a deodorant for living spaces and fabrics whose formula does not contain water. This means than it can be used with complete peace of mind not only to deodorize areas such as bedrooms, bathrooms or kitchens, but also wardrobes and shoe racks and even fabrics such as clothes (overcoats, scarves and pullovers) and furnishing (curtains, sofas and carpets) without any wetting or staining. The perfumes are skilful blends of fragrances selected exclusively for us, by major perfume producers, and meet any aromatic-emotional requirement.